The ‘Greek story’ simply diverts attention from the real task ahead which is the correction of the serious ‘design faults’ of the monetary union in Europe. 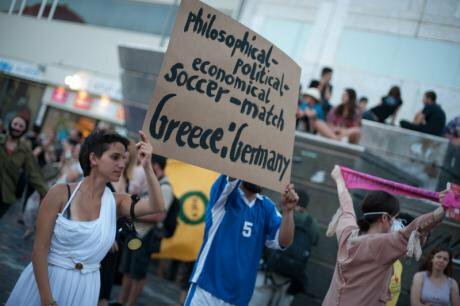 In Monastiraki Square, actors in a mock Euro match between Germany and Greece. Reporter#36588/Demotix. All rights reserved.Events in Greece sparked off the eurozone crisis in 2009 and continued to have a dominant influence on the course of the crisis ever since. Greece in 2009 had a huge debt problem which it managed to conceal from its partners in the EMU. Of course, you may ask how events in a small peripheral European country of 11 million people, accounting for only about 2% of Eurozone GDP, may cause a crisis in the Eurozone - the second largest economy in the world - threatening the stability of the entire global economy? Surely, first and foremost, a massive Greek sovereign debt is a massive problem for the Greek sovereign. Rule violations and lies must have consequences on those who violate the rules and lie about it. This conclusion, however, is not as straightforward as it sounds. Greece was a member of the European Monetary Union (EMU) which had, and still has, two cardinal rules: rule one, governments of member states must not over-borrow; rule two, if they do over-borrow, they must not expect or seek help from the European Central Bank (ECB). The Central Bank of the eurozone was not allowed to lend directly to governments. The problem for the euro-group governments was how to apply rule two when members, for whatever reason, violated rule one. Clearly the rule was put in place in order to deal with the ‘moral hazard’ problem. It was supposed to inhibit and restrain governments from ignoring rule one. Greece’s serious fiscal misdemeanors revealed in 2009, inadvertently and critically, exposed a fatal flaw in rule two: the strict application of the ‘no bail-out’ clause was effectively condemning member countries to default and exit from the single currency. Such harsh punishment could arguably be contemplated for serious offenders but only if the rest of the monetary union could be insulated from the effects of one member exiting the monetary union. Since the need for such measures to prevent ‘contagion’ was not expected or foreseen, no such measures were put in place when the euro was created. Greece, instead of being thrown out of the eurozone for its rule violations and fibs, was seemingly ‘rewarded’ with a massive 245 billion euro EU-IMF ‘bail-out’ and substantial debt restructuring. Whatever the real motives behind this decision - whether it represented a genuine desire to show European solidarity to Greece or simply self-interest - the result was unambiguous: Greece was given the opportunity for redemption. The country had to rebalance its economy through an economic adjustment program, designed and supervised by the so called ‘troika’, of fiscal consolidation and structural reforms. Similar assistance and adjustment programs (without debt restructuring) were extended to Ireland (2010) and Portugal (2011). During this period Ireland (faithfully and stoically) and Portugal (more or less faithfully but less stoically) implemented, completed and exited the programs imposed by their creditors. The Greek political system was fractious throughout this whole period. The implementation of the ‘troika’ adjustment program was haphazard and half-hearted and anything but ‘stoical’. Nevertheless, in 2014, despite the political turmoil, Greece was preparing for exit from the ‘troika’-imposed program. Both fiscal and current account deficits had not only been eliminated but turned into substantial surpluses - an economic adjustment success story that is unparalleled in global financial history. For the first time after six years of deep recession (more accurately of a 1930s style depression) Greece was expected to return to positive economic growth in 2014. Yet in December 2014 interest and concern about Greece dramatically shifted away from the possibility of Greek exit from the ‘troika’ program to a possible Greek exit from the eurozone or Grexit. The future of Greece and possibly the future of the eurozone were up in the air again because of the announcement of ‘premature’ elections in Greece and the pledge by the Greek opposition party, Syriza, to renegotiate the ‘troika’ program if it wins the elections. Syriza will put an end to austerity and demand debt forgiveness for Greece along similar lines to that granted to Germany by the London debt conference in 1953. The threat of repudiation of existing agreements has created exasperation among the political class in Germany who holds the eurozone’s purse strings, and other northern European countries. There is also, reportedly, considerable ‘bail-out fatigue’ among their electorate. From the standpoint of northern Europe, therefore, Greece appears to be ‘irredeemable’. Is it time for the ‘amputation’ option or Grexit? What was deemed not to be an option in 2010 and 2012 appears to be feasible in 2015. In terms of morality, is it not unreasonable and unfair to expect Greece’s prudent hard-working and responsible partners to ‘forgive’ the debt or ‘forget’ the strict conditions attached to the ‘bail-out’ that saved Greece from bankruptcy? This familiar story of Greece’s relationship to the eurozone and the related morality tale has become the dominant narrative of the eurozone crisis which divides Europe between the indebted and ‘imprudent’ southern periphery and the ‘prudent’ and solvent northern Europe. This narrative despite its resonance and credibility is flawed both in terms of its diagnosis about the origins of the crisis and its ethical conclusions. The eurozone crisis is a crisis of public indebtedness but not, as is commonly portrayed, a fiscal crisis. The euro-zone crisis was a crisis ‘waiting to happen’ with or without Greece’s rule violations and lies. What should the alternative narrative be? Since the ‘Greek story’ is so central to the dominant narrative, the best way to approach the alternative narrative is to start by supposing that Greece was not a member of the Eurozone in 2009. What would have been the course of the eurozone crisis without the Greek story? Counterfactual questions are, of course, notoriously difficult to answer with any certainty but it is fairly safe to assume that events in Ireland in 2010 would have sparked off the eurozone debt crisis. Unlike in Greece, however, where the Greek sovereign misbehaved, the Irish debt crisis was not the result of fiscal indiscipline. It was the result of what has been described as a ‘plain vanilla’ banking crisis. Non-compliance with the rules of fiscal discipline would not have done as an explanation for the crisis in Ireland. The Irish government’s management of its public finances prior to the crisis was in fact exemplary. Moreover many of the ‘structural reform’ issues that had plagued the Greek economy - tax evasion, overblown public sector, inflexible labour markets etc. - were absent in Ireland. The necessary ‘structural reforms’ had been implemented in Ireland twenty years early, transforming one of the poorest economies in the EU into the ‘Celtic Tiger’ economy - the ‘poster child’ of the neoliberal economic growth model for peripheral economies. If the deadly sin of ‘fiscal indiscipline and irresponsibility’ was not the cause of the collapse of the Irish economy or indeed of the critical financial problems in Portugal and Spain - the next two eurozone countries to be embroiled in the eurozone debt crisis - what caused the crisis in Ireland that subsequently spread to Portugal and Spain? Without a ‘Greek story’ the catastrophic public indebtedness in the euro-zone had to be explained not in terms of the misbehaviour of the public sector but in terms of the gross misconduct of the private sector, in particular from the ‘unholy alliance’ of property developers and bankers, especially in Ireland and Spain. Why was the private sector in Ireland and Spain able to bankrupt the public sector of these economies? The answer is to be found in the so called ‘design faults’ of the monetary union that was launched in Europe in 1999. European leaders decided to create and share a single currency but without the necessary political foundations. They hoped and expected that a well functioning monetary union would ‘eventually’ lead to greater political union in Europe. They anticipated that, initially, in a monetary union without a fiscal union the public sector could become a source of instability. Therefore a strict set of rules for fiscal discipline was put in place. The architects of monetary union in Europe believed that the private sector was fundamentally stable and therefore no comparable measures were put in place to monitor potentially destabilizing activities in the private sector. With hindsight they were wrong. For the period 1999-2008 the monetary union was malfunctioning but European policymakers and financial markets remained largely oblivious to and singularly unconcerned about the growing imbalances in the eurozone. A monetary union masks several imbalances in both the real and the financial sectors of the economy. For example, outside a monetary union current account imbalances and corresponding capital flow imbalances will be reflected in exchange rate movements. In a monetary union such imbalances can persist and remain uncorrected. They can also cause distortions and may increase financial vulnerability. In the eurozone the elimination of currency risk, inter alia, fostered lower interest rates and easier credit conditions mainly in the eurozone’s southern periphery and Ireland. Artificially high availability of credit and artificially low cost of credit resulted in excessively high levels of borrowing by both private and public sectors. In Greece imprudent politicians and in Ireland irresponsible bankers reacting to the same incentives created by a malfunctioning monetary union went on a borrowing binge. This was undoubtedly irresponsible but when the market provides the wrong signals governments need to act and correct the inappropriate market signals. This was not happening in the EMU. In Greece excessive borrowing may have financed the creation of non-jobs and expensive early retirement schemes in an overblown public sector; in Ireland and Spain it financed the building of empty flats in Dublin and in the Costa del Sol. These were different distortions in the economy but distortions nonetheless, resulting from the same ‘design faults’ of EMU – the lack of a surveillance mechanism for preventing crises and more crucially a mechanism for managing a crisis, once it occurs. There is no harm in castigating Greece for its fiscal indiscipline and manipulations of the official statistics. There is however a great deal of harm in ‘stigmatizing’ Greece, because it distorts the narrative of the crisis. Fiscal discipline would probably have prevented a debt crisis in Greece but it would not have prevented the eurozone crisis. The ‘Greek story’ simply diverts attention from the real task ahead which is the correction of the serious ‘design faults’ of the monetary union in Europe. According to the dominant narrative Greece is the eurozone’s weakest link with the longest and deepest recession and highest debt to GDP ratio of all eurozone countries. Five years of austerity produced neither growth nor reduction in indebtedness. Greece is also the ‘black sheep’ of the monetary union. Syriza, the main opposition party is adding insult to injury by demanding debt forgiveness and end to austerity. Who is going to pay for all this? At this point the dominant narrative raises the moral question again of whether it is fair that the (mainly) German tax-payers’ hard-earned money be used to help the profligate Greeks? There is, however, another aspect to this particular ethical dimension of the eurozone crisis which rarely gets a hearing in the dominant narrative. Greece may have broken the written rules of a monetary union but Germany has been violating the unwritten rules of a monetary union. Legally the two cases are different but morally they are equivalent. Moreover it can be argued that in terms of actual economic impact Greece’s violation of the written rules is far less significant than Germany’s violation of the unwritten rules. It is, of course, shocking for the ‘virtuous’ German government and tax-payers to be accused of unethical and harmful behaviour but, as Mandeville in The Fable of the Bees and Keynes in The General Theory had argued, private virtues can sometimes become public vices. Suppressing wages in order to gain competitiveness and achieve export-led growth makes sense outside a monetary union but not within a monetary union. This is not only bad economics but also poor ethics. Amassing huge current account surpluses and refusing to eliminate them is not playing by the rules of the game in a monetary union. Germany has been benefiting from the malfunctioning of the monetary union but is refusing to participate in the adjustment process by reflating its economy. It is also obstructing the ECB from taking measures to arrest deflation which is making the debt dynamics in the indebted periphery more challenging.